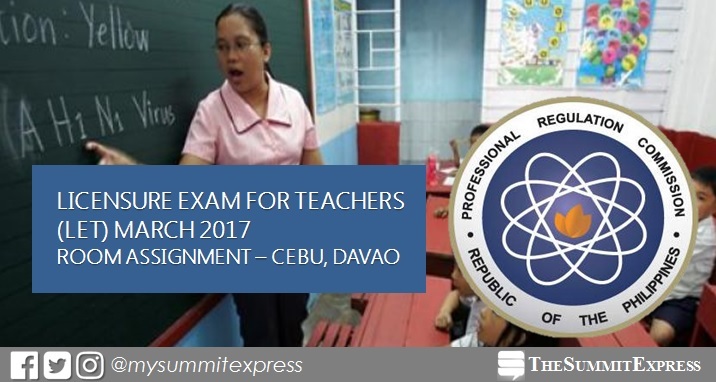 The Professional Regulation Commission (PRC) has released working list of room assignment for takers of March 26, 2017 (Sunday) Licensure Exam for Teachers (LET) in Cebu and Davao City. Aside from Manila, Cebu and Davao always draw the biggest turnout of examinees for the teachers board exam. The full list of room assignment for Cebu was announced on Monday. Meanwhile, PRC has activated room list for Davao on Tuesday, after the reloading of links. Room and school assignment for elementary and secondary level (Agriculture and Fishery Arts, Biological Science, English, Filipino, MAPEH, Math, Physical Science, Social Studies, TLE and Values Education) were made available online. The March 2017 LET will be held simultaneously in the cities of Antique, Baguio, Cagayan de Oro, Catarman, General Santos, Lucena, Puerto Princesa, San Jose (Occidental Mindoro), Iloilo, Legaspi, Tuguegarao, Rosales, Tacloban, Pagadian and Zamboanga. The Summit Express will also update this website for the results of March 2017 LET. Bookmark this page or visit the website more often for more announcements.